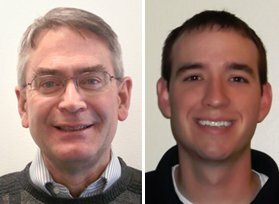 In our continued effort to expand Nemetschek Scia sales in North America, we are pleased to announce the addition of Joe Jun and Ben Follett to the Nemetschek Scia North America team. Joe Jun (on the left) joined the Scia team as structural engineering consultant. He has a documented record of success in the development, marketing, and sale of new engineering products and services used in the fabricated metal and construction industries. Joe comes to us with more than 26 years of engineering and sales experience. He has worked for such organizations as USG Corporation, Atkore International , CFM Companies, and the American Institute of Steel Construction. He attended the University of Illinois, where he completed a bachelor of science in civil engineering, and master in science in structural engineering. Off the clock, Joe prides himself as being a “Jack of All Trades” around the house and in working with cars….although a “Master of None.” In addition, he is an avid college football fan and supports his University of Illinois “Fighting Illini.”. Ben Follett (on the right) joins the team as structural engineering consultant to help support our sales efforts, as well as support existing customers with technical support and project consulting. He has a strong background in structural analysis and design in the design-build industry. He received a bachelor of architectural engineering degree from Penn State. Prior to his work in the software industry, Ben was a structural associate with Michael Baker Corporation, an Engineering News Record top 50 AE firm. He currently resides in Pittsburgh, Pennsylvania with his wife, Amanda, and their Boxer-Dachshund mix, Cooper.